Available in Canada May 2, 2018. A comprehensive test market conducted in Arizona, California and Florida from October 2017 to January 2018 resulted in the resounding validation of AVX, particularly among golfers who prioritize distance and extremely soft feel. Beginning today, Titleist AVX is available in golf shops across the U.S. AVX will be available in Canada May 2. The precision manufacturing of AVX at Titleist Ball Plant 3 in New Bedford, Mass. – also home to the industry-leading Pro V1 and Pro V1x models – has been accelerated in order to meet golfer demand and the worldwide launch of AVX in the coming months. An innovative high speed, low compression core technology results in a powerful engine to drive remarkable distance with exceptionally soft feel. The invention of a new high flex casing layer enhances speed and controls spin to promote even greater distance. The proprietary GRN41 thermoset cast urethane elastomer cover has been specifically formulated by Titleist Golf Ball R&D to deliver premium scoring control with exceptionally soft feel and long lasting durability. A unique catenary aerodynamic design delivers a piercing, low trajectory while providing a consistent ball flight on all shots. 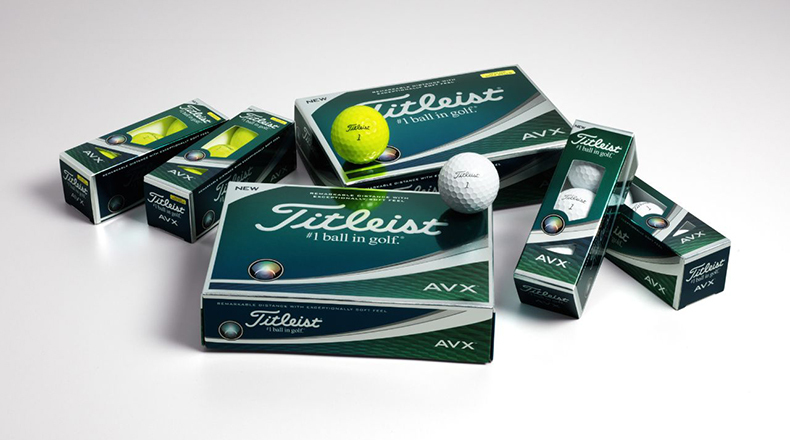 AVX is made by Titleist associates in the company’s state-of-the-art Ball Plant 3 manufacturing facility to the highest performance and quality specifications in the industry, ensuring the most consistent performance ball to ball, and dozen to dozen. AVX is offered in both white and high-optic yellow.